So when Laura is offered a new job in Australia, the Newman family think their dreams have come true. But as the old saying goes - be careful what you wish for, you might just get it. As the hapless couple soon find out, problems have a way of following you, no matter how far you go to avoid them. Having read Love and Sleepless Night the book before this one, I already knew about Laura and Jamie's lives and how crazy they get. Throw a baby and a new job into the mix, things will be even crazier than before. 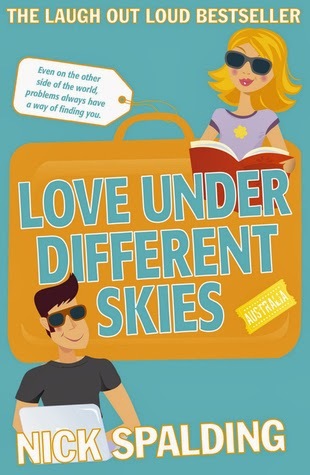 Love Under Different Skies is set in both Laura and Jamie's point of views, Laura's point of view is in the form of a diary whereas Jamie's is set out in a blog form. From the very first point of view, I was enthralled by the new storyline for these amazing characters and the humorous lives that they lead. Laura and Jamie's lives changed in the last book when they had their daughter Poppy, but when Laura get a job in Australia they decide that maybe a change of scenery will be good for them. Though what once was a good idea, soon changed when problems they had tried to leave behind seemed to follow them even to Australia. Then again, problems cause a mess wherever they go, but will all the stress and heartache be worth it in the end. Though was the job the right move for Laura in the long run, Jamie's book is longing get is book published though moving to Australia was good idea not only for his writing but also it will help with the marriage strain that has been put on Laura and Jaime's marriage. This story is full of laughs, romance and family moments that are everything you would want in a book. I would recommend this book to anyone who wants a laugh and to read about the crazy lives that Laura and Jamie lead as well. Nick Spalding is an author who, try as he might, can't seem to write anything serious. He's worked in the communications industry his entire life, mainly in media and marketing. As talking rubbish for a living can get tiresome (for anyone other than a politician), he thought he'd have a crack at writing comedy fiction - with an agreeable level of success so far, it has to be said. If you fancy getting in contact with Nick then visit his website at spaldings-racket.blogspot.com / add him on Twitter: @spaldingauthor / add him on Facebook: Nick Spalding / or email him at nick.spalding@hotmail.co.uk.